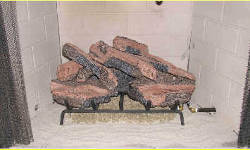 So you've purchased a new gas log set or maybe you have an older set that needs an update. Turn your fireplace into a masterpiece with gas log accessories and a few extras to customize its look to match your home's style. If you have purchased a ventless gas log set, please consult your owner’s manual before adding any accessories where they may impede the flame pattern as this could create an unsafe situation. 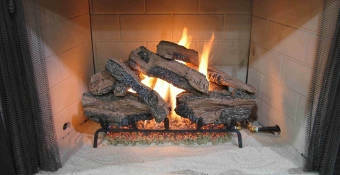 Ventless gas logs are designed to burn safely within a set flame pattern and any variation to that pattern may affect the burn. The addition of accessories such as acorns, lava rocks, and pine cones around the floor of the fireplace is acceptable in ventless locations. This is the standard installation with the gas line exposed, sand on the bottom of the fireplace floor, and the logs seemingly placed without much thought. 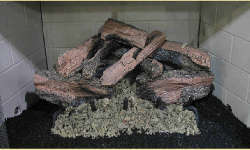 Here we see an improved stack pattern: the grate was pushed back to expose more flame in the front, lava rocks were added on top of the sand, and wood chips & pine cones were added for decoration. Do not alter manufacturer’s stack pattern for ventless log sets. 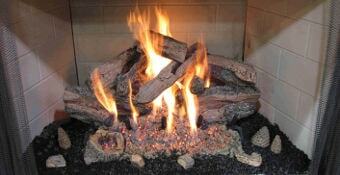 Install your gas logs according to manufacturer specs. 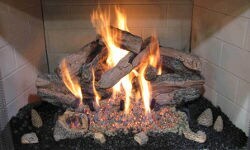 Add additional media under the logs and across the floor of the fireplace. Add decorative accessories to complete the new look. 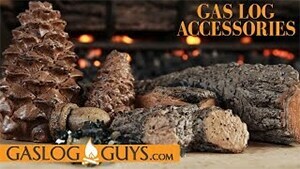 We understand that buying gas logs can be confusing. There are a lot of factors to consider, and we are here to help.